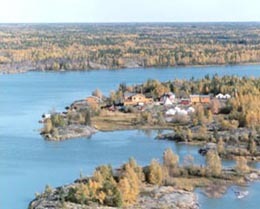 Description Great Slave Lake is the tenth largest lake in the world by volume. Great Slave is fed by several rivers, the most important being the Slave River. The lake is drained by the MacKenzie River, which drains into the Arctic Ocean.  Great Slave Lake: pristine or polluted?  Herdendorf, C. 1982. Large lakes of the world. Journal of Great Lakes Research 8:379-412.  International Lake Environment Committee, the United Nations Environment Program and Environment Agency, Government of Japan. 1997. World Lakes Database.